“…the dawn counted its nomadic steps / to the border…” To read Tanella Boni’s poetry is to be elevated into a rigorous linguistic performance where the language-play forces History to confess its own mythology. Translucent, extraordinary poems transform usually ineffable explorations of war, violence, and the ever-tangled exit out of these realities, into meticulous experiences that––while rendered elegantly––nevertheless leave the reader face to face with the horror of our own humanity. Boni’s metaphors are unexpected, yet exact, so exact that they pierce the psyche and awaken the reader to a broader, more active world. The aurora has ribs, for example. Breath is a naked-winged swallow. The day has eyes. The dawn convulses. Time is a sculptor. Boni’s writing is astute, she even personifies words themselves, transforming them from linguistic signs into a mythological choir. But this collection is not in any way a lush, anthropomorphic post-colonial fantasy, where flora and fauna are animated for the sake of literary tourism. Instead, Boni’s skills reside in her remarkable ability to excavate language itself, and to use those remarkable, unpredictable findings to represent the many-layered silences surrounding the politics of violence as articulated by the body and the world. In The future has an appointment with the dawn, Boni not only expands poetry’s possibilities (“…ordinary life / between routine and rupture…”), but in searing, unique, meticulous language, her work challenges the limit of writing itself. Whether in his translations of Josué Guébo or in his own original poems, Todd Fredson tirelessly commits his language to the difficult, critical work of examining the notion of belonging and home-losing. As though effortfully straining language through the page, Fredson’s poems are lyric quests that examine what he calls “the threshold between witness and participation” and his own subject position as a white, U.S. American male in an Ivory Coast on the brink of civil war. These are poems of history rescaled: fatherhood, miscarriage, work, and grasses. These are poems of place and of distance, severance and repetition. Fredson’s lyrics astound with a sensuality and sparseness that conjure not only memory but the feeling of being possessed by remembering. Such poems remind us that the body is a palimpsest and the eye is tuned by image, by light, by experience. They problematize the idea that we are ever actually in just one place, and it is this very porousness that makes Century Worm read like an epic as much as a collection of individual pieces. This is a book of personal and national history, lament, and ferocious vulnerability. Todd Fredson’s Century Worm is a journey through memory fields crisscrossed with roads where “history offers no instructions.” Here the poet asks: “it isn’t the bird that is beautiful, is it, but the scale it gives to the field?” These poems enact a deeper kind of witnessing, each line “an elegant lure,” urgent and necessary. Defiantly elegant. It is elegy and evocation, a summoning of the dead as a chorus speaking to those who do not see, or do not care, to remind them of the consciousness of the Earth and of history's will to life, and the ordering of change... . The poet's hand is essential to our redemption. I can't help but be moved by this large ambition of Josué Guébo, by his impossible task of bringing together poetics as different as those of Whitman and Mallarmé, by his huge desire to give a voice to those who cannot speak for themselves and also to find the secret of lyric utterance. Josué Guébo's My country, tonight offers English-language readers their first sustained encounter with one of the important contemporary poets of the Ivory Coast and Francophone Africa. Translated with superb nuance and verve by Todd Fredson, who also provides an insightful introduction to the collection, Guébo's poems present a stirring, condensed and often ironic vision of his country's long colonial and post-independence struggle for cultural, political and economic sovereignty, against the power-plays of the neoliberal West and global capitalism. Both lyric and polemic, My country, tonight, by "tear[ing] the names open for us," adds new depth to our post-colonial understanding of recent Ivorian history and enriches our appreciation of African poetry today. An utterly moving poetry collection by Ivory Coast poet Josué Guébo, My Country, Tonight, translated by American poet Todd Fredson, embarks on erudite and crushing utterances— lyrics that are severed, that perplexingly and astoundingly grab sense with brevity. What I mean to say: these poems rest wholly on a gentle lyric gesture as well as its opposite, a single word tempo. They resist what is too sincere, and they puncture emotions’ lament with powerful lucidity—they pierce a colonial history that is “wearing its boreal red.” This poetry collection draws poignant conclusions about what atrocity looks like to its poets and writers. Fredson delves deeply into preserving and honoring the historical sites and sights, and the intensity of an anti-colonial speech, through his contemplative translation. Todd Fredson's first collection of poems is a sometimes live run of cradle songs balanced with the falling catkin atmospheres of some of our more terrible vehicles of human salvation. I think of Rilke's pained-city, and Roethke's Far Field. What I celebrate here is the originality of this work and the simple fact that I cannot easily make it subordinate to other important first books of our period. 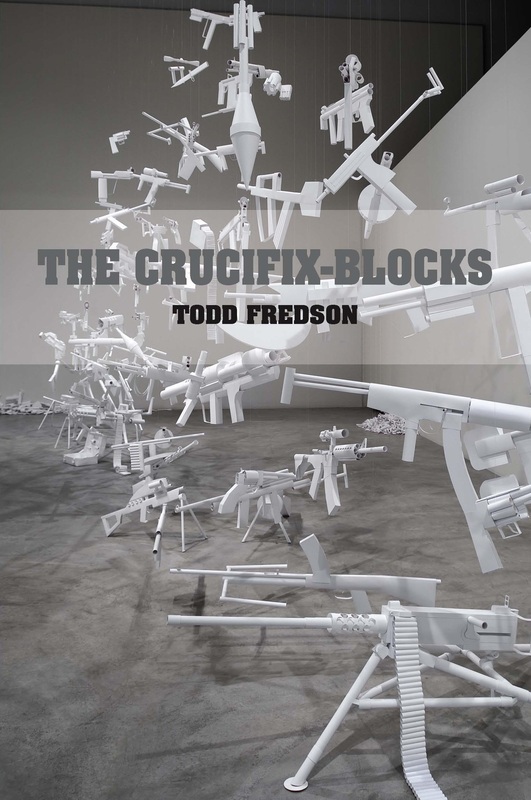 The poems in The Crucifix-Blocks, Todd Fredson's mysterious and beautiful debut, spring from that most authentic of impulses: deep feeling. But walking, as he does, at the union of cloud and consequence, he's written a book that affects the ear as much as it does the heart. In exploring the rewards of undertaking treacherous travels--both of body (through West Africa) and the mind (romantic and familial love)--it wants to center the self on a great continuum of meaning. It looks back, it looks forward, but most importantly, it looks out. This is a passionate, gorgeous and satisfying book. Again and again, these meditations expose their quiet wisdoms with an admirable sleight-of-hand. Against the meditative flow of any given passage, unexpected and exquisitely honed images appear with the force of lightning strikes. The precise and surprising architectures of these poems help expose the heart's--and the mind's--inevitable emergencies. Todd Fredson brings a delicate, incisive, and lyrical social realism to American poetry, and with this single book has emerged as one of our most powerful younger voices.